ICC T20 World Cup 2016 Schedule: The International Cricket Council (ICC) released the schedule (Time Table) of 2016 ICC T20 World Cup for Men and Women. A total of 58 tournament matches, including 35 men’s matches and 23 women’s matches, will be played in the 27-day tournament in India. The ICC World Cup Twenty 20 2016 is slated to start on 08th March 2016, and will go on till 03 April 2016 which will entirely be held in different stadia across India. New Delhi and Mumbai will host the semi-finals on March 30 and 31 respectively, while Eden Gardens in Kolkata will be the venue for April 3 finals. The women’s semi-finals and final will be followed by the men’s knock-out matches. You can check out the Complete List of ICC T20 World Cup 2016 Schedule for Men’s and Women’s from below. ICC Men’s T20 World Cup 2016 Teams | Schedule | Live Streaming. Watch: ICC Men’s T20 World Cup 2016 Teams | Schedule | Live Streaming. Also See: ICC Women’s T20 World Cup 2016 Teams | Schedule | Live Streaming. With the help of the above link you can freely download the Time Table of ICC T20 World Cup Schedule and Fixtures in PDF Format. 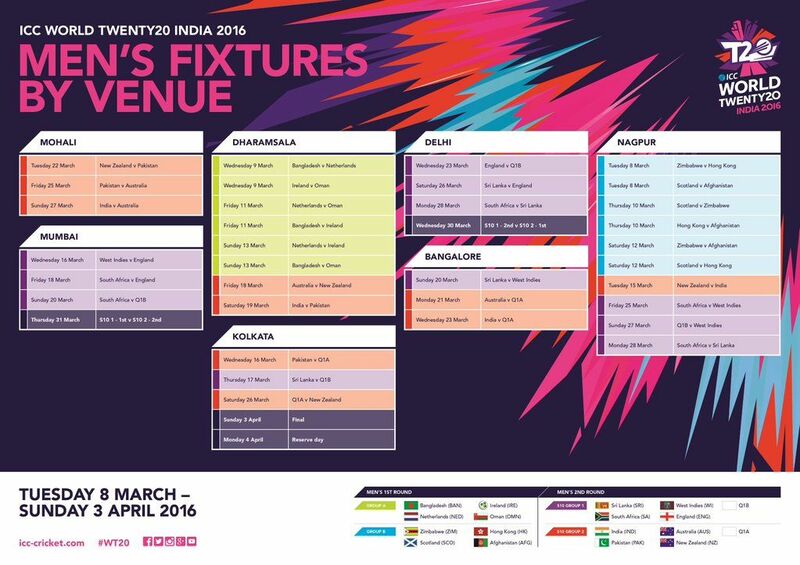 I hope you like this post on ICC T20 world cup 2016 schedule/ fixtures / Time Table. If you like this Please share it to your friends and help them to download the pdf format of ICC T20 World Cup (Men’s & Women’s) Schedule.